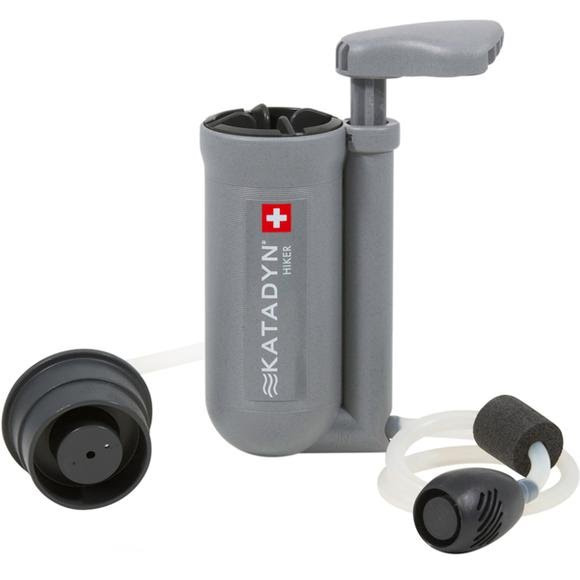 The Hiker Microfilter is ideal for camping, trekking and backpacking. It's lightweight, compact and the easiest way to make safe water. Featuring a unique .3 micron pleated glassfiber filter that will remove 99.99% of bacteria, cysts and sediments and a ribbed housing for extra grip. The Hiker Microfilter is ideal for camping, trekking and backpacking. It&apos;s lightweight, compact and the easiest way to make safe water. Featuring a unique .3 micron pleated glassfiber filter that will remove 99.99% of bacteria, cysts and sediments and a ribbed housing for extra grip. The mechanism itself is simple where approximately 48 strokes of the pump will equate to 1 liter of drinkable, filtered water. Superfine glassfiber, within two supporting layers, forms a depth filter. Nominal pore size of 0.2 micron mechanically filters all bacteria and protozoa. The flexible glassfiber is pleated resulting in an extremely large surface area and a very high capacity to absorb dirt. A pleated design inside the cartridge means more surface area than most other microfilters. The simple design means very little maintenance is needed and requires minimal cleaning. Backcountry Series products from Katadyn are ideal for camping, backpacking and trekking. They are lightweight, compact and the easiest way to make safe water. Backcountry Series products are the favorite choice for all-around use.